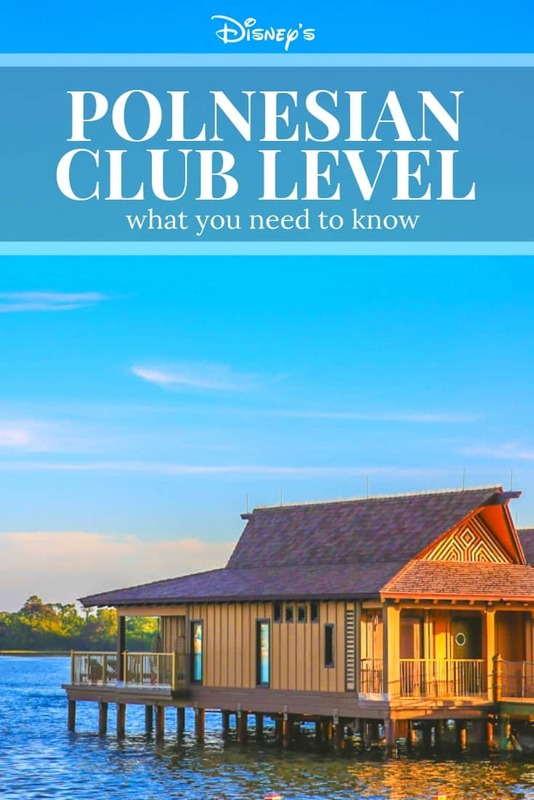 Is the Disney Polynesian Resort Club Level Worth it? The front entrance of the Polynesian resort transports you to the South Pacific. I’d visited the Polynesian restaurants and Trader Sam’s Tiki Bar so often that I could start my own New York City outpost with their collectable cups, so we decided it might be time give the hotel try. I am an avid Disney fan. I love it all, the music, the magic, and the Mouse. This love has been passed down to my children, especially my son. We’re big Disney fans and visit a few times a year. 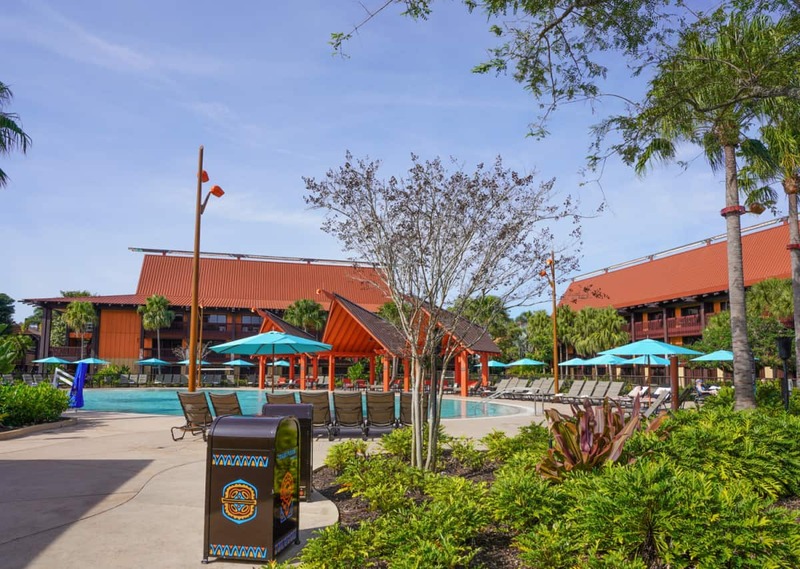 To him, there is no better vacation than a Disney vacation, and it was his dream to stay at the Disney’s Polynesian Village Resort. So, we packed up our insanely large collection of Mickey ears, and off we went. Our personal review is definitely mixed. Our biggest complaints were accentuated by paying a premium price for a disappointing club level experience. The Polynesian really shines when it comes to transportation. They offer both boat and monorail service to Magic Kingdom as well as bus service to the other parks. In addition, it is a quick walk to the Transportation and Ticket Center to catch the monorail to Epcot. An additional bonus to staying at the Poly, the Grand Floridian, or the Contemporary on the monorail line is Disney’s new way they conduct park entrance security. A boat leaves the Polynesian for the Magic Kingdom behind the Disney Vacation Club’s newest deluxe bungalows. If you are a Disney Resort guest on the monorail line, you can go through security and bag check at the hotel prior to boarding the monorail, which saves time getting into the parks. Also, the security guards tend to be more jovial, offering stickers and cards, making security more Disnified and less like an airport. TO ANSWER YOUR QUESTIONS ABOUT PLANNING YOUR NEXT DISNEY VACATION. We never waited more than five minutes for a bus, marveling at how quickly they came. We were able to venture to all four parks in five days and felt that we never really waited for any transport. Uber saved the day a few times, but that was due to us running late, not the bus service. Due to our time in the parks, we underutilized the pool area greatly. My son could Disney from morning until night so we often came from the parks after 4pm with barely enough time to shower and change for the evenings. On the few occasions we did use the pool, it was quite refreshing and enjoyable. The theming is spectacular with a large volcano slide and a small waterfall. The splash pool at the main Polynesian resort pool. The Disney Vacation Club over water bungalows and the small sandy beach provide more of the South Pacific vibe. 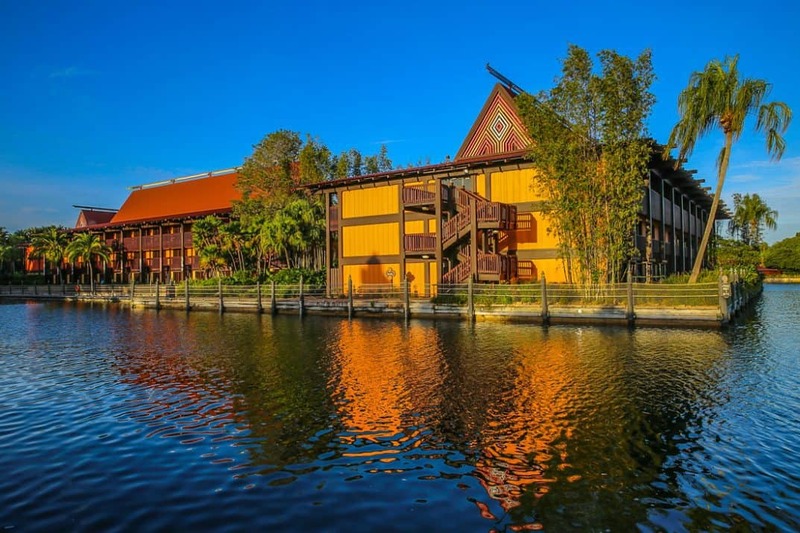 The Polynesian longhouses add to the atmosphere and it’s easy to lounge the day away here. A second pool is quieter and more adult. 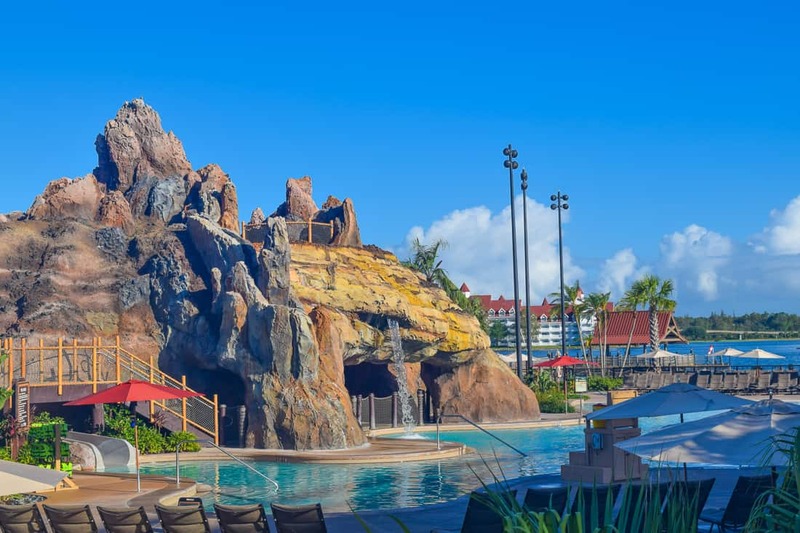 And the Polynesian is one of the few resorts to offer wait service at the pool, so it’s easy enough to order lunch and drinks from the comfort of your seat. 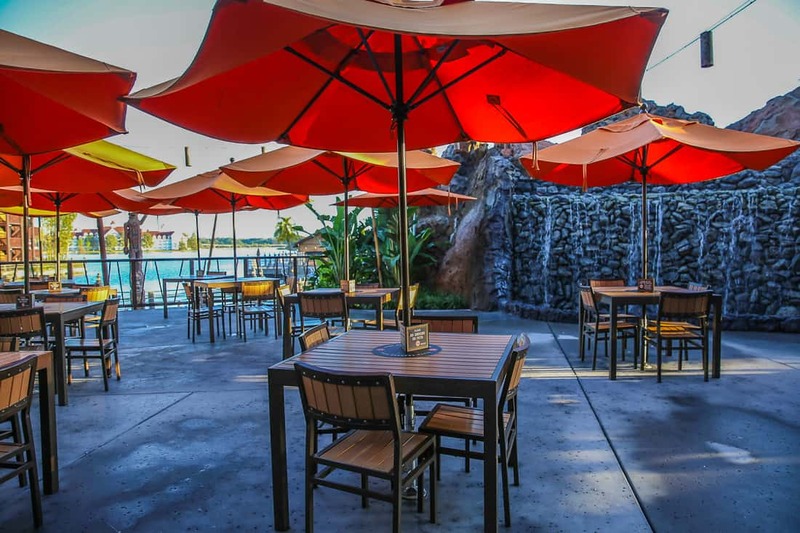 The Barefoot Pool Bar offers light meals and tasty drinks, and they are open until 9 or 10PM most evenings, making the Polynesian a great place to watch the fireworks while swimming. The music from the show is also piped in which adds to the environment. There are many outdoor dining options to enjoy the resort grounds and views. Evenings bring out the best in the resort ground’s magic. There’s a resort ceremony each evening to light its torches with a brief fire dancing show. When it finishes, the whole resort comes alive with fire torches. There is something gorgeous about the sprawling lawns, soft music, and views of the illuminated castle. The challenge from this unique resort’s atmosphere is its popularity with people staying at many other hotels. Dare I say, it’s the busiest of the Disney deluxe resorts? It sure felt like it. This makes it very difficult to maneuver around the hotel in the evenings. And if you were hopeful for a quiet glass of wine, this is not the spot for you! 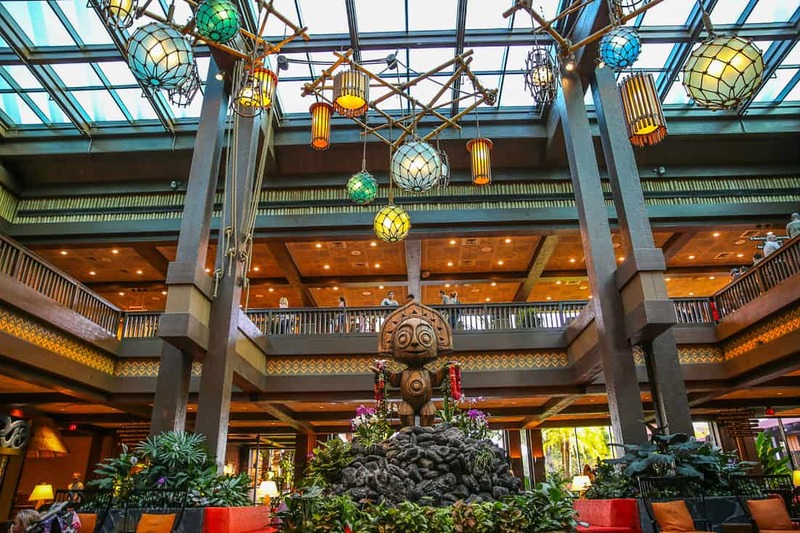 The hotel offers a fair amount of restaurant options in the Great Ceremonial House, the official name for the main building that houses the lobby, reception, and monorail entrance. Inside the Great Ceremony House, the Polynesian lobby building. Capt. Cook’s is the resort quick service restaurant and Kona Cafe, a mid priced, consistent cafe with a sushi bar, is the best bet for last minute reservations. 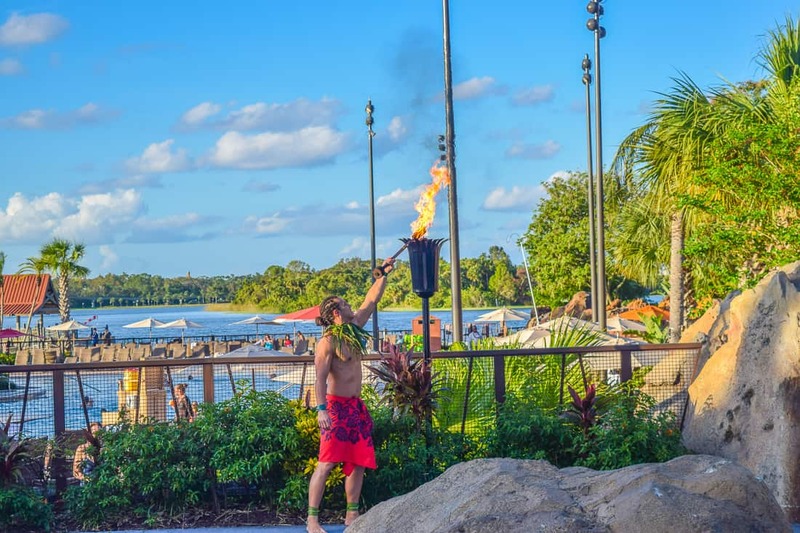 Some of the most popular Disney restaurants are at the Polynesian including their well-known luau, the Spirit of Aloha dinner show. 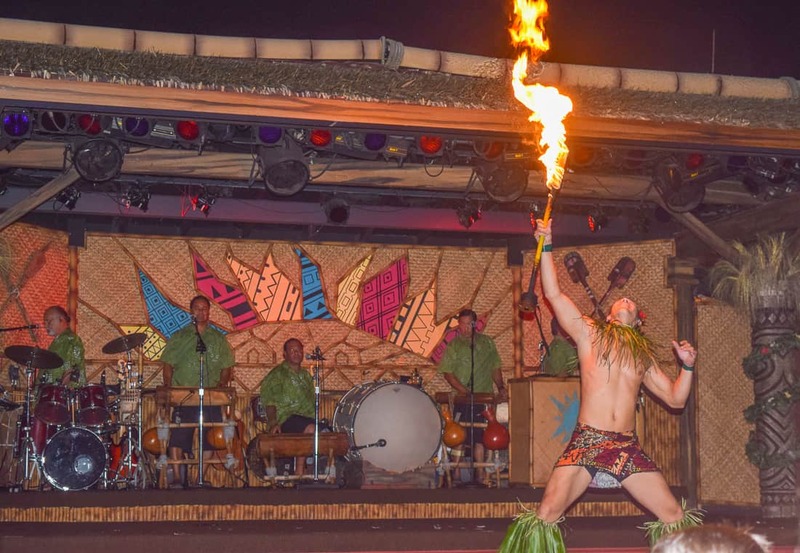 The Spirit of Aloha Dinner Show at the Polynesian. In addition, there is the Barefoot Pool Bar and the attached Oasis Grill. Parents who are fans of Pineapple Dole Whip can order the Frosty Pineapple, soft serve infused with dark rum. While it’s safe to say you won’t go hungry, most of these dining options require advance reservations. So unless you know six months in advance that you feel like Hawaiian food, you won’t be having Tonga Toast! Stich, Mickey, Lilo, and Pluto are characters to meet at Ohana. 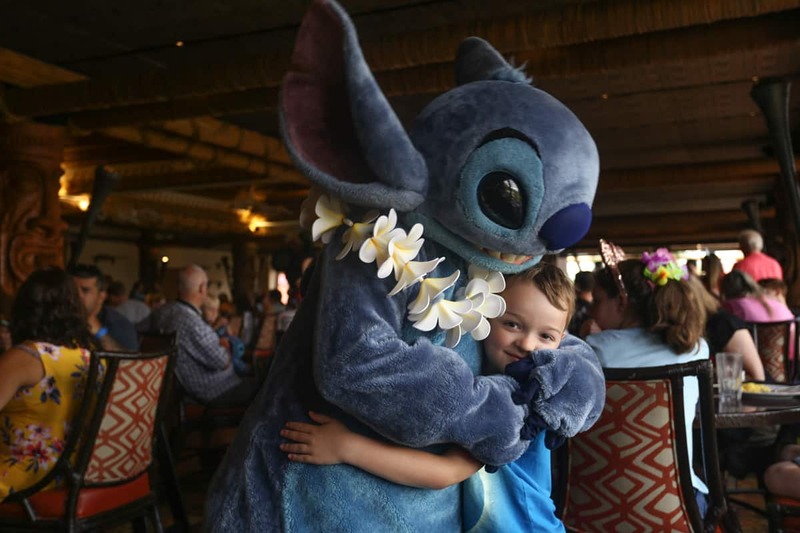 ‘Ohana has castle views as well as an extremely popular character breakfasts with Lilo, Stich, Mickey, and Pluto. The breakfast event starts with a photo with Pluto while guests await their tables. There is a TV playing shows in the bar area with small chairs for children who get restless waiting. Breakfast is served family style. The first course is a coconut bread (that is actually the low point of the meal, tasting like big sheets of wholesale club cinnamon rolls. Then the meal improves with the special tropical juice served at the Poly, a fruit plate, and a large tray of breakfast food. 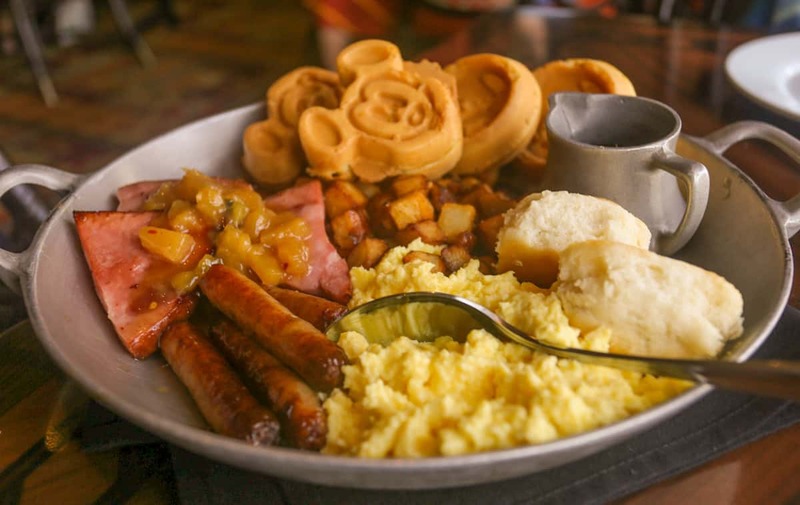 Scrambled eggs, Mickey Waffles, pork sausages, ham covered in pineapple chutney, fried potatoes, and biscuits are the main course. It’s not an ideal choice for families with food allergies and restrictions, though I have heard that the kitchen can accommodate restrictions with advanced notice. Meals are served family style with a fairly set menu. Lilo waltzes Pied Piper style around the restaurant for a family parade. Children grab instruments and join in— similar to Pooh’s Friendship parade at the Crystal Palace inside Magic Kingdom. During dinner, guests watch the Magic Kingdom fireworks, and the show’s soundtrack is piped into the restaurant, and these tables for both meals get booked up in advance. Try again at the last minute for an open table if they are booked. Trader Sam’s is worth a mention here because of its entertaining theming and staff. 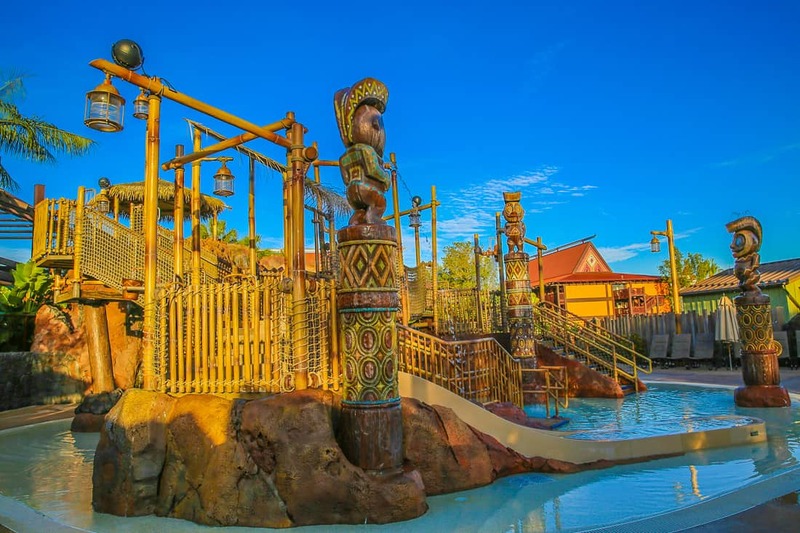 This Tiki Bar welcomes kids from 4PM until 8PM, with light entertainment as well as some small bites. We ordered the Zombie drink, and the kids delighted in watching the staff behave like zombies as they served it. Disney magic is alive and well here! They also have a lovely outdoor terrace with live music. Disney calls their Kids’ Clubs Children’s Activity Centers. Lilo’s Playhouse came to the rescue when my exhausted kids weren’t up for dinner at the Yachtman’s Steakhouse one night. This fabulous club, located on property is a gem. Cast members serve kids both dinner and a snack, and there is a full roster of activities like a luau with Chip and Dale. My kids adored this club so much so that my daughter begged to go back the next night. The kids’ club is pricey though at $55 a child, and it’s open from 4:30-10PM. There’s no tiered pricing or hourly drop off so note that this is a full evening commitment. Having booked the trip last minute, all that was available for our dates was a Polynesian club level room. While I love club level at other hotel brands, Walt Disney World hotels are not known for fabulous club level lounges. They tend to be crowded, and people hover over mediocre food displays determined to get their money’s worth. 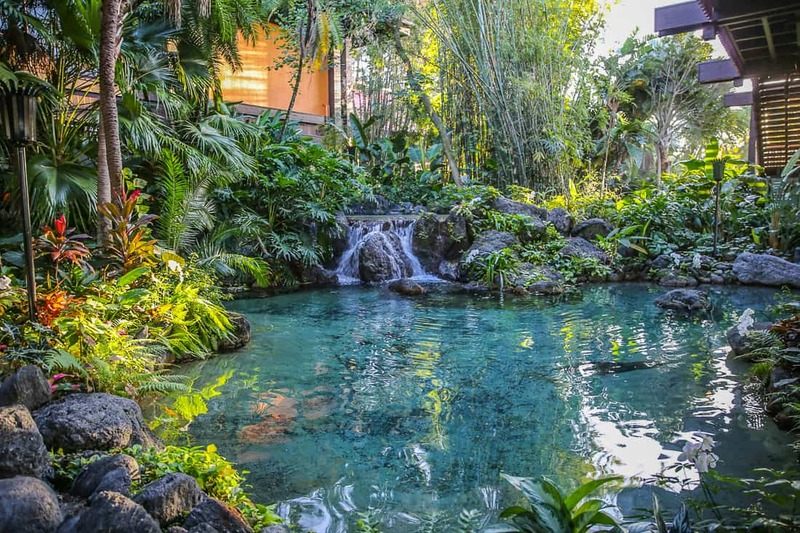 The club lounge at the Polynesian receives decent reviews, and it does boast a theme park view of Cinderella’s Castle and the Seven Seas Lagoon, so we thought it would be worth a try. Upon check in at 10am, we were pleasantly surprised that our room was ready. That’s Disney World magic, as resort rooms are rarely ready before 3pm. The second floor rooms at the Disney Polynesian resort have neither a patio nor a balcony. Unfortunately, our room was probably the worst in the club building, located on the second floor where rooms have neither a balcony nor a patio. Our request to change rooms was met pleasantly but with the firm insistence that nothing else was available during our stay. After waiting a less than an acceptable amount of time for our luggage, we made our way to the club lounge. This is another area where Disney fails compared to other hotels. Bell staff are always overwhelmed and backed up. It is easier to collect your luggage yourself from their storage area or keep it with you. 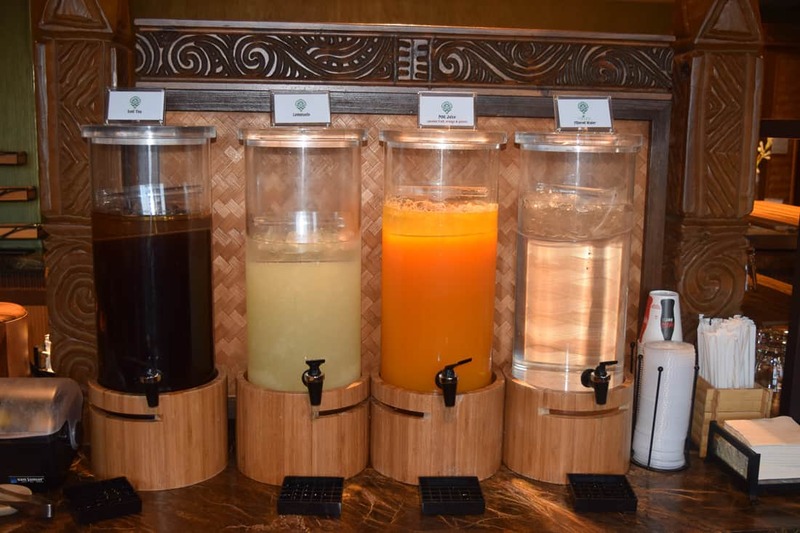 The Polynesian club lounge offers continental breakfast between 7-10AM, light lunch/snack between 11AM-4PM, drinks and canapés between 5-7PM, and cordials and sweets between 8-10PM. The offerings were decent: grilled chicken, lettuce and all the accoutrements for a make your own salad. In addition, there was a variety of snacks like chips, gummy bears, and goldfish crackers. Upon request, the pleasant staff will give you a beer at any time during the day, and they always seemed to have Smuckers Uncrustables and apple juice on hand for the kids. Drinks available all day at the Club Lounge. Breakfast in the Poly Club lounge is simple and barely a step up from a continental breakfast at an airport chain motel, but my kids were happy and fed. There is something to be said to dining while looking at the beach and Cinderella’s castle. There are basic pastries, cereals, fruit, yogurt and usually hard-boiled eggs, cheese, and a breakfast meat. On weekends the lounge has the welcome addition of smoked salmon. 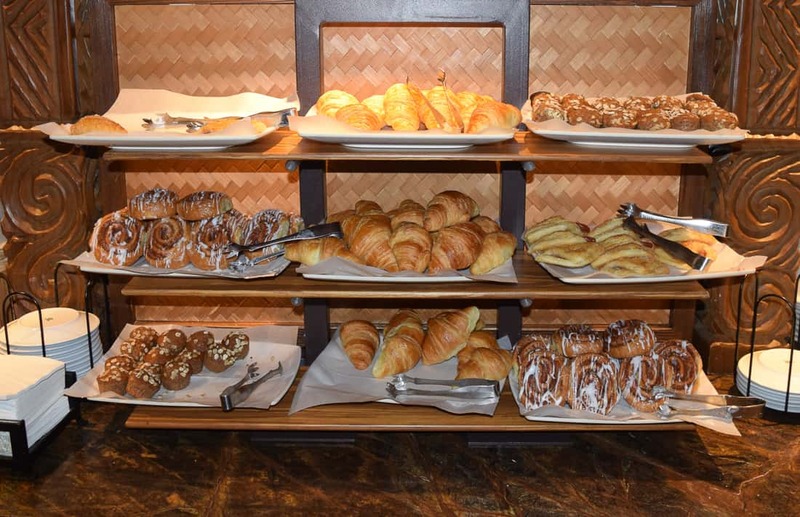 Breakfast pastries at the Club Lounge. This is where I take issue with the lounge though. While I’m a huge proponent of not wasting food, and recycle my own leftovers at home, it bothers me when hotels do this blatantly. Whatever lunch meat the Polynesian lounge served was repeated with breakfast the following morning. So, if grilled chicken was on offer, then the next morning grilled chicken was served with breakfast. It made me feel resentful as guest that I the premium price I paid for a club level room was not enough for fresh food, and that the Polynesian was indifferent to what the hotel industry typically offers for a club room that costs more than $1000. We did find a few perks to being club level guests. For me, the biggest is breakfast. The Disney room service experience is terrible, as the wait times can exceed an hour, which is not an option when my kids wake up really hungry. The club level saves me the trouble of having to source breakfast from the hotels’ quick service restaurants and drinking instant coffee from the room. I made really good use of the Nespresso maker in the lounge. Wines and beers are complimentary in the Club Lounge. The club lounge also came though when we felt that the Polynesian’s evening crowds were unbearable, loud, and chaotic. From 5-7PM in the evening, the club level offers cocktails and snacks. We chose to utilize this option on the night we attended Mickey’s Not So Scary Halloween Party and found it both convenient and refreshing. My kids scooped up pineapple skewers, veggies, and Uncrustables while my husband and I enjoyed a decent American Pinot Noir and some tuna tartare. When I inquired about the possibility of sparkling water, a bottle of Pellegrino was immediate proffered. The other perk to the lounge is that hosts that are rarely busy provide dedicated concierge service to club level guests. They can do anything regular concierges can do. But, we found that the lounge hosts, while pleasant, were less knowledgeable than other Disney Cast Members we have encountered over the years. The pool area was well themed and fun with a volcano water slide and a huge splash area. 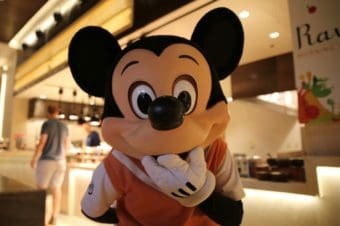 While Disney Cruise Line concierge hosts have the reputation of offering the best service within the Disney brand, the resort lounge hosts aren’t anything like that. If you’re a proficient My Disney Experience user, you can probably do everything for yourself more quickly. Four clicks on My Disney Experience App answered my question easily, and we were on our way to Hollywood Studios. In 2018, Disney World is now offering club level fast passes for those who stay three nights or longer with 3-day or longer tickets. Guests of the Polynesian bungalows are also eligible for this new VIP Fast Pass offer. Guests can book 3 extra Fast Passes that work for any park at the 90-day window. This means that in addition to the traditional 3 Fast Passes available to all, these extra VIP Fast Passes can confirm you can book the new hot rides like Pandora or Toy Story Land. The cost is $50 per person per day. I think this will make club level worth it for certain trips when the newest rides are still booking only to those lucky ones who book when their Fast Pass windows open. I’ll enjoy trying more club level lounges at the different deluxe hotels to see which one we like best. So long, Poly! We’re staying somewhere less crowded next time! The reason that I don’t love staying club level is that one of the joys of Disney, for me, is the food and the restaurants. 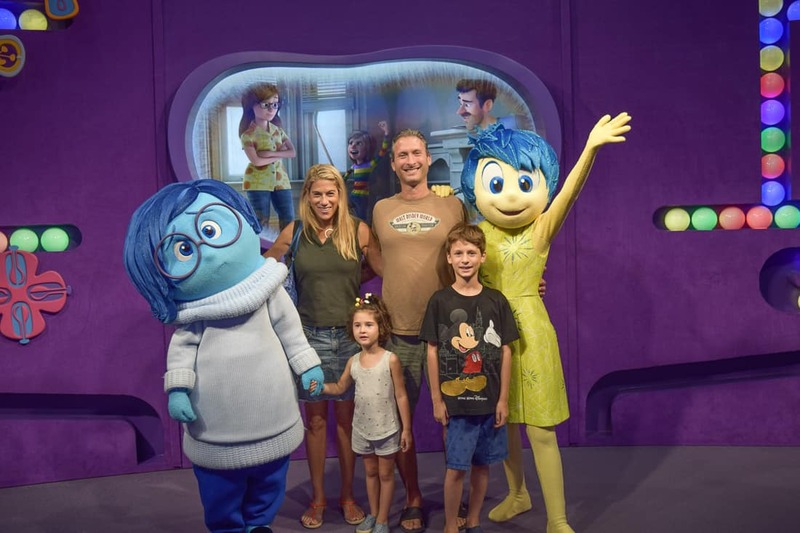 While I’m the first to admit that Disney World restaurants are not quite Michelin starred (with the exception of Victoria & Alberts), I enjoy the theming and their family friendliness. We travel a lot and take our kids to a fair share of high end restaurants where they need to show grown up behavior. At Disney, we try to pick really entertaining places to eat to let them be kids. There’s nothing quite as fun as seeing Snow White tap your daughter on the shoulder while she’s digging into a meal or watching my son’s face light up when Goofy wants to dance with him. Plus, I’ve long convinced myself that anything with Mickey ears is calorie free! 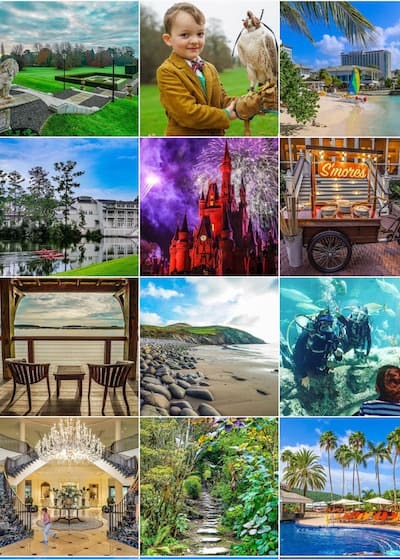 For these reasons, and more (notably, the wine list at Jiko, the Italian Bar in Epcot, and the view from Narcoossee’s) I don’t see the value for paying for concierge level. I would rather take the premium I paid to reserve that club level room and spend it in the Disney restaurants with much better food. All in all, while we had a pleasant stay at the Polynesian, but at the end of the day, I simply don’t think it was worth the money. The hotel charges an exorbitant amount for the location. While we did love the convenience of the hotel, the crowds in the public areas were stressful like the parks. In addition, since the prices here are higher than those at the Four Seasons Orlando, it seems doubtful that we would ever stay here again. When I leave a hotel, I like to leave feeling relaxed. I left the Polynesian feeling underwhelmed. My kids still thought it was wonderful, but they don’t pay the hotel biIl. I think I’ll retire my lei and return to my favorite Walt Disney World Resort – Disney’s Boardwalk Inn. 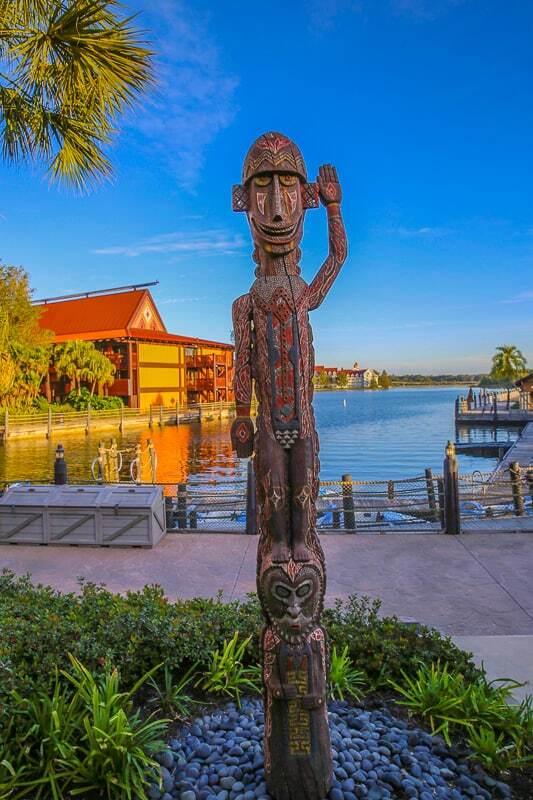 Check your dates for rates at the Polynesian. There’s a way to save as much as 50% off of a stay if you book a villa or even an over-the-water bungalow. 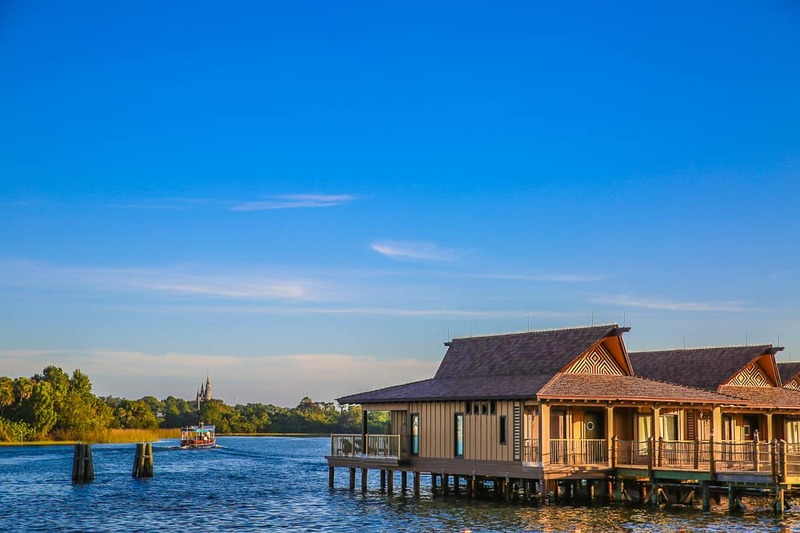 The villas and over-the-water bungalows at the Polynesian Resort are part of the Disney Vacation Club, Disney’s version of timeshare units, but it’s still available for the public to reserve. 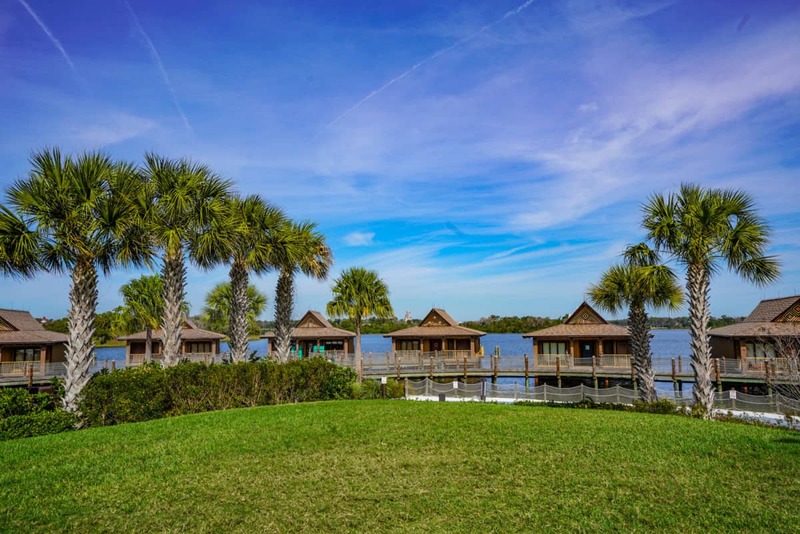 The Disney Polynesian Resort bungalows are DVC units you can book for less by renting points. Our experience with David’s Vacation Club Rentals was seamless. 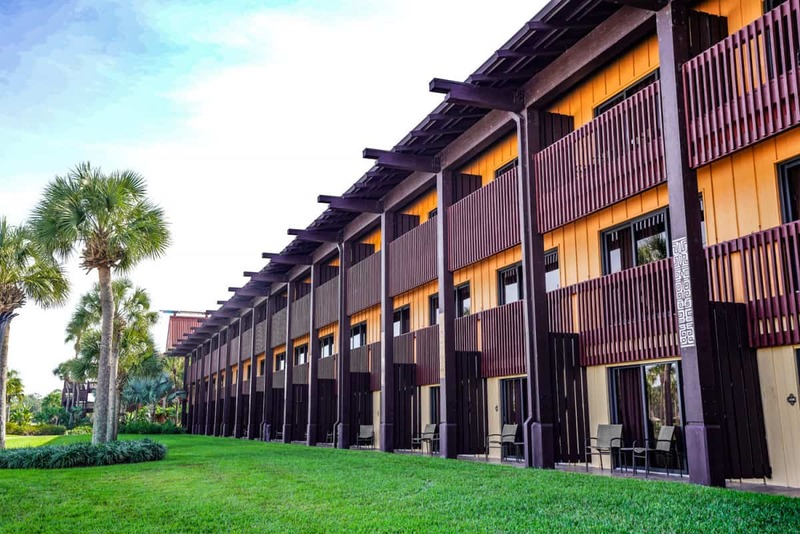 Given that the Disney Vacation Club rooms are almost always newer than the hotel rooms, this is the best way to stay deluxe while saving money. David’s works as an intermediary between you and the DVC owner who is selling you points. The owner doesn’t get paid in full until your check in date. So David’s Vacation Club Rentals works like an escrow account to protect you. 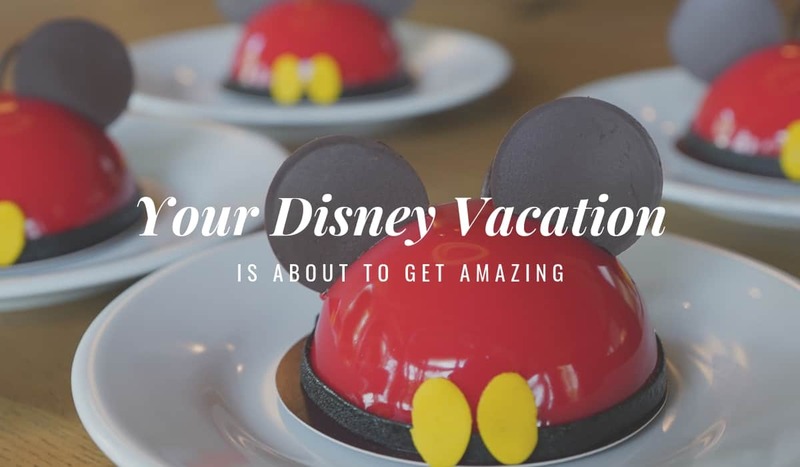 Once booked, you can still add Magical Express reservations or Disney dining plans. You can see how much you will save by using David’s point calculator on your stay dates. Then compare that cost with booking the villa units directly. You must pay a refundable deposit for them to query owners for your stay. They will look at first, second, and third choices you list. When they have been unable to book me something, they refunded my deposit immediately. If that happens, you can speak to an agent who can tell you what is available around your original query. The agents have found alternate options for my dates if my first choice wasn’t available. The only drawback by using David’s service is that you will not receive daily housekeeping without a fee. And you must commit to your travel dates; the booking is nonrefundable. Let me plan your Disney World vacation. I’ll help you choose where to stay, your theme park and ride schedule, and steer you to the right restaurants. I’ll share what VIP experiences are worth every penny and show you what to skip. There is a minimum of three nights Club Level and 3 days of Club Fast passes, so it starts $150 per person. You don’t have to choose consecutive days within your 5 day ticket, though.